Facebook is world`s no 1 social network and favorite of billions of people who interact on it everyday. You can not only add your friends in your id but also can make strangers your friends. To keep your account safe facebook give you settings to set in your own way. But if you find any suspicious activity in your account and you think someone else also log in in your facebook account than you can end that suspicious session by following steps and after that should change your facebook password. 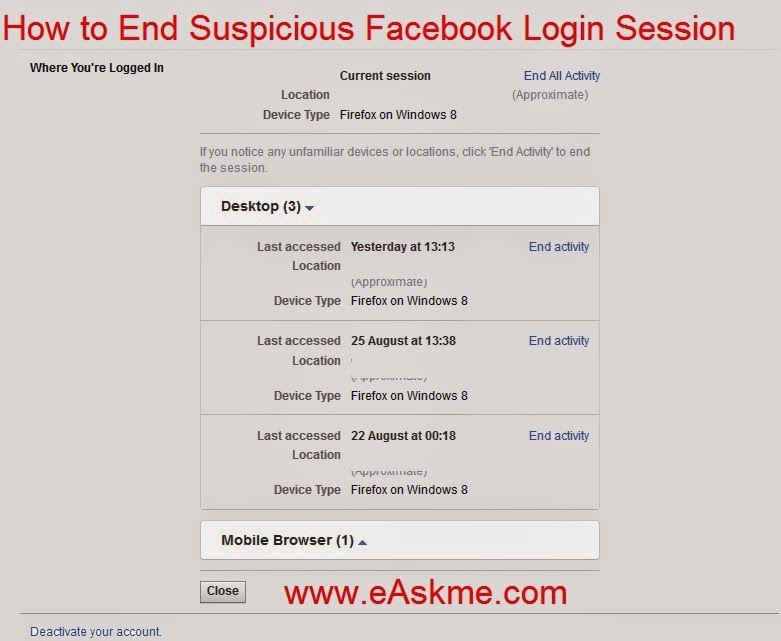 How to End Suspicious Login Activity on Facebook ? Login to Facebook and click on right top end button and click on Settings. Now Click on "Security" tab. Click on edit on "Where You're Logged In" you will see the activities from where your account is login. you can end any suspicious activity. Click on "End Activity" to end any suspicious activity.